HANDS ON REPTILES®, wildlife shows, animal and pest control. Interactive wildlife displays, animal and pest control. We are experts at wildlife shows, education with reptiles and other animals, wildlife capture and relocation and everything else that comes with these general lines of business. For wildlife displays and education, our specialty is kids wildlife themed birthday parties, educational school incursions with snakes and other interactive forms of educational display. We bring both venomous and non-venomous species of reptile and other animal to venues and have surgically devenomized deadly snakes, better known as venomoids to protect the safety of our clients and ourselves. We also have public liability insurance cover, relevant Children’s and police checks and cards as well as an unrivalled perfect safety record spanning more than 30 years in the wildlife education and pest control businesses. 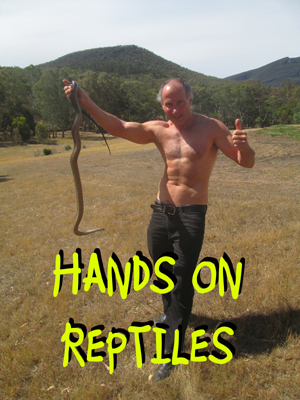 If it is not hands on reptiles® (as in us), then it is probably a risk!